Germany may not have won either open water gold medal at the Olympics in London, but make no mistake: it is still the epicenter of the open water world. That was proven over the weekend on the Canadian side of Niagara Falls, where the Germans won 4 out of 6 open water gold medals at the 1st ever FINA Junior Open Water World Championships. First in the 17-18 boys 7.5km swim on Friday morning, Rob Muffels won going-away in 1:24:59.9 to become the first-ever World Junior Open Water champion. The Americans took their only individual medal in the same race, with Jordan Wilimovsky from Team Santa Monica crossing the line 20 seconds back for silver in 1:25:19.0. The Czech Republic’s Jan Micka took bronze in 15:48.5. The other American, David Heron, finished 11th overall out of 43 competitors in 1:25:47.2. That afternoon, South Africa’s Michelle Weber won the girls’ 14-16 5km swimm in 1:00:05.6. The cool temperatures and flat course (the race was swum in a rowing basin, much like the Olympics were) was condusive to a fast pace, but this was a world-class time for the 15-year old. Weber is a very exciting talent for the South Africans, who have historically been very good in open water as well. As a 14-year old, she was already going 8:44’s in her 800 free, but after stalling out a bit this year in the pool has sought new challenges in the ocean. The Germans didn’t take a gold medal here, but they did manage both silver (Lena-Sophie Bermel in 1:00.:08.0) and bronze (Patricia-Lucia Wartenberg in 1:00:27.0). Jessica Arnold from the United States’ Shenandoah Marlins was 11th in 1:00:39.9, and her countrymate Regan Kology from Chatham, New Jersey was 25th in 1:03:34.6. 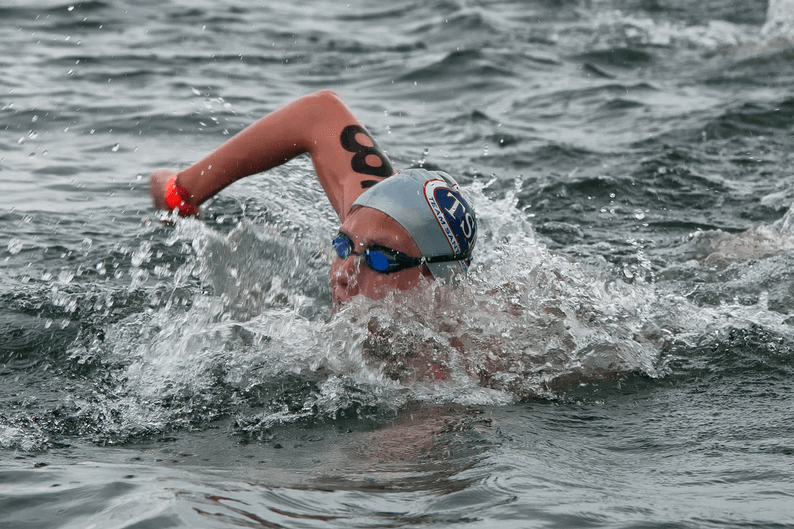 On Saturday, the ladies of the 17-18 division kicked off the morning action with their 7.5km swim, and again the Germans were kept off of the podium. China’s Shi Yu won in 1:31:41.7, which was a bit of a slower pace than one might have expected after the races on Friday. It was swum very tactically, however, with nobody able to pull away from the field. Yu won by just a second over Russia’s Anastasia Krapivinia (1:31:42.8) and Lizeth Rueda-Santos from Mexico (1:31:45.7). Mission Viejo’s Brooke Lorentzen nabbed a top-10 finish in 1:32:04.3 at the back of the lead group. Team Santa Monica’s Liliana Casso was 17th. In the final individual race of the meet, the Germans got back on top of the podium thanks to a 57:10.0 from Felix Bartels in the boys’ 5km. Bartels modestly gave credit to a “very strong pack” after the race, but in reality he was very fast in this race, holding a 1:09/100 meter pace. Diego Vera from Venezuela placed 2nd in 57:30.8, followed by another Chinese medal from Yaho Han in 57:38.4. The Americans put another swimmer in the top-10, with Mission Viejo’s Nicholas Norman toaking 5th in 57:56.2, about 14 seconds off of the podium. Countrymate Brendan Casey was just a tenth behind him in 6th in 57:56.3. These team events, swum in “time trials” fashion where all three swimmers go off together but at one-minute intervals from other teams, put three-athletes together with last-across-the-line determining the team’s time. These teams are co-ed, requiring at least one of each gender in the three-swimmer team (to account for most teams not bringing more swimmers than that per category). The Germans, not surprisingly, dominated the Youth event with their slowest finisher, Bermel the girls’ champion, touching the pad in 34:14.4. The Russians took 2nd in 34:31.4 with the team of Gennadiy Ivashinenko, Anton Evsikov, and Dari Kulik crossing finally in 34:31.4. The Italians made perhaps the best use of their drafting with all three swimmers crossing the line withing 6-tenths of each other, with a final number of 35:27.8. That bronze came despite not winning any individual medals. The American trio of Nicholas Norman, Brendan Casey, and Regan Kology finishing in 35:42.0. The Germans again took gold for their 6th overall medal of the meet, with Daniel Trosin crossing the line 3rd in 33:38.2. The Russians swam very well together for silver in 33:56.2, with the American trio of Jordan Wilimovsky, David Heron, and Brooke Lorentzen placing 3rd in 34:00.5. Though that time is only about 4 seconds out of silver-medal position, the Americans might feel as though they could have done better. Their inexperience showed as Wilimovsky and Heron pulled away from their teammate Lorentzen in the closing kilometers; they actually had a fasteraveragefinish than did the Russians by far, but the name of the game in these coed races is giving your female teammate as much to draft off of as possible, as her speed will usually determine the final finish. Water temperatures for the “Junior” races in the morning (17-18) sat around 22.4 degrees celcius, or 72 farenheit, with the “Youth” (14-16) events being swum in a near-ideal 24 degrees celcius (75 farenheit – just a few degrees cooler than your average swimming pool). There was a tiny bit of chop in the water from wind, but being swum in a rowing basin it was still a very flat course. Northwestern’s gotta be excited for the new season with Wilimovsky’s recent performances at Jrs and Jr Open Water Worlds!